Ertblog: Northern Rock: did the bank's comms seal its fate? Northern Rock: did the bank's comms seal its fate? 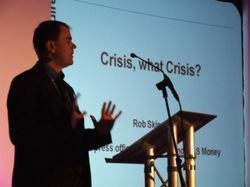 I spoke at the Don't Panic Guide to Crisis Communications last Friday (25 January 2008) in London. My subject was how to manage communications for a crisis, especially in financial services. It's highly topical: since I spoke at Don't Panic's original event in Manchester last year Northern Rock's extraordinary implosion has made the world realise that a crisis in a bank can be just as challenging reputationally as a plane crash. But wait. Don't jump to blame the PR team for the failure of the business. Over that weekend, everyone wanted to know if savers' money was safe. But thanks to the limitations of Britain's savers' compensation scheme, any savings over £35,000 were completely unprotected. (And only the first £2,000 was totally protected.) So while I'd strongly recommend in most cases that companies in a crisis go out of their way to get their side of the story across, in Northern Rock's case I'm not convinced that such an approach would have made much of a difference. In short, the PR battle was lost when we learned that the Bank of England had agreed Northern Rock's emergency loan on Thursday 13 September 2007. The four day delay before the Chancellor announced that Northern Rock savings up to £100,000 would be totally protected meant the bank couldn't give a confident, happy answer to the crucial question: 'Is my money safe?'. Northern Rock would have gained little had Adam Applegarth toured studios admitting that savings over £31,750 were unprotected. He'd have been forced to rely on arguing that it was unthinkable that the Government would allow Northern Rock to go under, risking the life savings of many north east voters. True, as it happened, but not a strategy to save your reputation. NOTE: after Northern Rock's crisis hit the headlines, the Financial Services Authority increased the maximum compensation to £35,000. Further changes are expected. The most moving presentation at Friday's event was by Heather Edwards, the head of communications at Bolton Hospitals NHS Trust. Heather talked about the tragic deaths of three mothers and a baby in the Royal Bolton Hospital's maternity unit over a three month period in late 2005 and early 2006. The NHS Trust didn't think there was a link, but decided to launch an independent inquiry just to make sure. The inquiry confirmed that there was no link. The Trust deserves great credit for setting up an inquiry. Some organisations would have been tempted to keep things quiet, fearing media headlines. Bolton was bidding for extra funding at the time, and announcing the inquiry could have jeopardised that bid. As the Trust's chief executive told Heather, "It's the right thing to do." The right thing to do. So often ignored, yet almost invariably the best approach if you want to maintain a good reputation. As I told Heather on Friday, her presentation was just as moving second time around. (I had seen when we both spoke at last May's Don't Panic event in Manchester.) Just as impressive was the way Bolton's head of midwifery personally visited the bereaved families rather than rely on an impersonal letter. The personal touch: it's still amazingly powerful even in the Facebook era. Any advice for Gordon Brown? After my speech, one of the delegates asked me what advice I would give to Gordon Brown. (This was the day after Peter Hain resigned as Wales Secretary and Work and Pensions Secretary.) I replied: act as a human being, not as a politician. If that sounds glib, I added that too many politicians and business people inhabit their own world, remote from the people they are supposed to serve. Small wonder they don't always create trust. The resignation of Peter Hain is a classic example. Hain clung onto office as long as he could, damaging himself and the Labour government. It's hard to believe that career politician Hain of 2008 is the same man as young Peter Hain, who came to fame as a campaigner against cricket and rugby tours to apartheid-era South Africa almost 40 years ago. There's much to admire in Hain's career, from the fight against apartheid through his support for Welsh devolution to the struggle for a settlement in Northern Ireland. The shame is that he didn't do the right thing earlier over the funding of his campaign to become Labour's deputy leader. People on benefit don't have the excuse of pleading ignorance if they've not disclosed income. A smart Work and Pensions Secretary would have realised in an instant that he could hardly claim greater rights than those of his constituents.